First performed in Berlin in 1928, Bertolt Brecht’s Threepenny Opera has transcended boundaries and has been uncovering diverse modern interpretation in Indian theatres over the last three decades in India. Often referred to as the Beggar’s Opera, this Brecht classic was adapted for the screen, stage and audio plays in various countries addressing a contextual relevance to the socio-economic structure where the proletariat is always downtrodden. India has played a significant role in adding layers to Threepenny Opera over the years and still manages to draw a parallel with the present society. 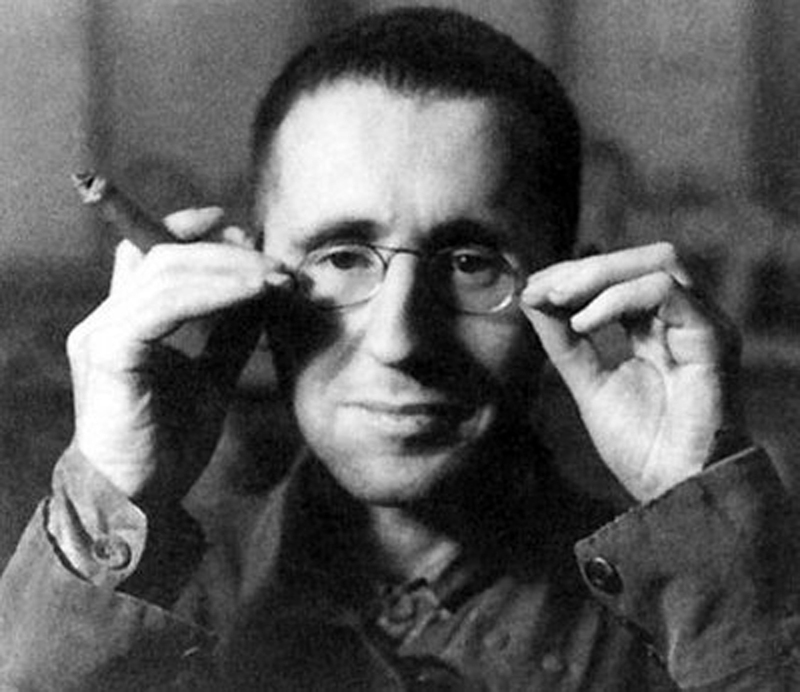 The Threepenny Opera by Brecht was first of its kind that aimed to educate people more than entertaining them. It started with specific stage setups that would have an alienation effect on the audience. The theatre made the audience delve into a fantastical and fake real world. The not-so-happy ending of the play, the apt representation of the hypocrite upper-class and a combination of Brecht’s comic timing with Kurt Weill’s ballads made the play an instant hit in the post World War I era. Now, the theatre is profusely adapted in various parts of the world. 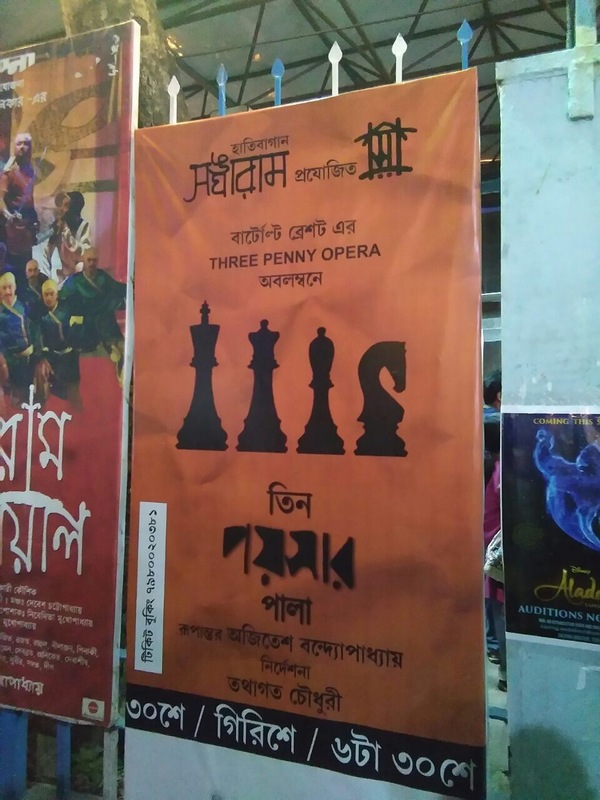 India’s connection with Threepenny Opera perhaps started in the 70s with Ajitesh Bandyopadhyay’s famous Tin Paisar Pala starring him and Utpal Dutt in the Bengal theatre scene. In the recent times, there are multi-lingual adaptations of this Brecht play in India and the subject of interpretation still finds a semblance of the annotations on social change mostly inspired by the writings of Karl Marx. The play, whether staged in New Delhi, Mumbai or in Kolkata, criticise the capitalist outlook of our modern worldly bourgeois system and takes a stand in favour of the working class. In October-November 2017, there were and will be three different productions of Threepenny Opera in India. The SRCPA Repertory presented a Santanu Bose adaptation of the play into a comedy at the Shri Ram Centre for Performing Arts (SRCPA). Then there is Imaad Shah (son of Naseeruddin Shah) directing his maiden theatre at the St. Andrews Auditorium in Bandra on November 10 and 11. 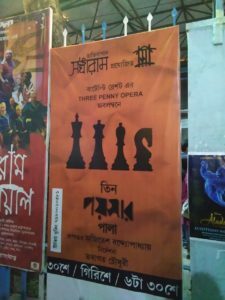 In Kolkata, a Bengali production staged their interpretation of Tin with mostly-unknown faces on October 30. While the first remains loyal to the English text, the Bengali adaptation was mostly based on the translation done by Ajitesh Bandopadhyay in the early seventies. Foul mouthing was a major crowd-puller during the early days, however, now when films, songs and even theatre have slowly taken a postmodern look, it was important to find the right setup for such an ‘era’ piece of work. The plot follows the life of a bandit and his association with thieves, prostitutes, beggars, back alleys and dual-faced men in a dark world. Mack the Knife or Macheath or Mahindra in various productions represents a murky side of the society that still yearns for justice against oppression. Will art help them revive? We don’t know – however, the attempt that was made by Brecht in Berlin while reading Das Kapital still finds its repercussions in the Indian theatre space – a legacy that looks at commerce in a kaleidoscopic viewfinder bringing the grey aspects of an unequal society in the forefront.